Teaching Unit 3 and 4 Biology for the first time in a small, rural school is a big responsibility. Although the class is small (only eight students), they are all keen to do their best and achieve an ATAR score that enables them to be accepted into the tertiary course of their choice, including nursing, physiotherapy and a Bachelor of Science. Although there are plenty of paper-based and online resources available, there are few other teachers in the local area to share ideas and teaching strategies with. 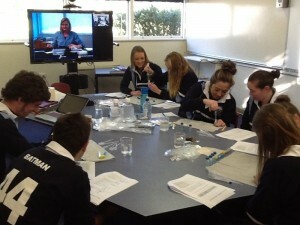 In Melbourne, beginning teachers have the advantage of the Biology Teacher’s Network and professional development at locations such as the Gene Technology Access Centre. Our class was invited to attend the “Body at War” program for the World Day of Immunology at GTAC this year. For our students, this means getting up at 4.00am, travelling up to one hour to the Warrnambool train station and then a three hour train trip, returning home at about 11.00pm, after the three hour return trip. Otherwise, an overnight excursion, staying at the Melbourne Metro YHA, which adds to the significant cost of travel. This year, our Year 12 Biology class has had two opportunities to participate in video-conferencing using the Polycom equipment, connecting with the Gene Technology Access Centre. There are several programs available, and we were able to access the “Signalling Molecules” and “Hendra Virus” workshops. Both sessions included hands-on activities and student worksheets, with resources provided well in advance by GTAC. Both presentations were delivered by experienced teachers, with excellent images, animations and explanations. The excellent image quality and audio allowed the GTAC presenters to see and hear all that was happening in the classroom, asking and answering questions just as if they were in the science laboratory. Although students were, at first, a little reluctant to interact with the presenter, this is how they would react with a guest speaker in the classroom as well. Students agreed that both sessions were valuable learning experiences that assisted them to understand and apply biology concepts. For me, it is an excellent professional development opportunity that enhances my ability to teach the Unit 3/4 Biology course. And all without leaving Hawkesdale P12 College! This post came from Britt’s global2 blog – Technoscience for teachers, which has some great advice about using ICT in the classroom.